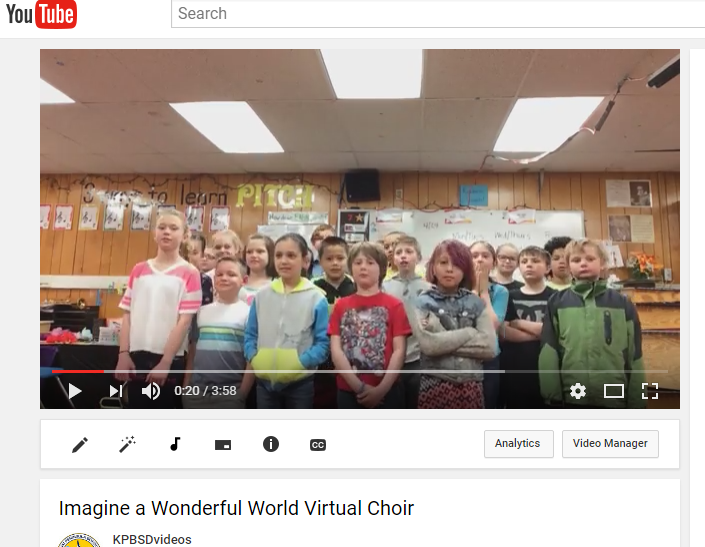 In April and May, three KPBSD Redoubt Elementary music classes (4th, 5th, 6th) joined students from Michigan and Texas to learn a song and employ technology to create a video with 115 young people from three states singing the same song together in a virtual choir! All composer credits are in video. All songs copyright to original composers. This entry was posted on June 1, 2017 at 4:15 pm. You can follow any responses to this entry through the RSS 2.0 feed. You can skip to the end and leave a response. Pinging is currently not allowed.